Napoleon was 5 feet 6½ inches tall, average height at the time. In his early years he was quite lean and only after 1806 did he become heavy. In his younger years he was often described as sickly in appearance, his skin having a yellowish pallor. He had fine white teeth, which he was proud. His nose was slightly curved, with a "sharp and delicate modelling, [but] was less prominent than one is inclined to suppose from the evidence of his portraits." His eyes, deep-set, were reportedly gray or gray-blue. Report by Keralio, the Inspector of Military Schools, when Napoleon was in school at Brienne: "Monsieur de Buonaparte (Napoleon), born August 15th 1769. Height: 4 feet 10 inches and ten lignes. Physique: good. Health: excellent. His character displays docility, honesty and a sense of gratitude. His conduct is blameless. Has regularly distinguished himself by his diligence in Mathematics. Shows sufficient acquaintance with History and Geography, but is weak at exercises and recreation. Should make an excellent naval officer. Deserves to be entered for the Ecole Militaire at Paris." A woman who knew Napoleon in 1795 told Stendahl: "Had he not been so thin as to have a sickly air which was quite pitiful to see, one would have realized that he had unusually delicate features. The lines of his mouth in particular were full of charm." Miot de Melito at the time of the first Italian Campaign: "I was singularly impressed by his appearance. Nothing corresponded to the picture which my fancy had made of him. In the middle of a number of Staff officers I noticed a man under middle height, of extraordinary leanness. His unpowdered hair, cut square beneath the ears in a most peculiar fashion, fell down over his shoulders. He wore a loose coat buttoned up to the neck, edged with narrow gold braiding, and a hat with tricoloured plume. At first sight his face did not appear handsome, but the strongly pronounced features and ardent, scrutinizing eyes, combined with his sudden, impulsive movements, betokened a determined character, while his broad forehead declared the deep thinker." The son of General WÃ¼rstemberger, who accompanied Napoleon through Switzerland after Camp Formio in 1797: "Bonaparte was rather slight and emaciated-looking; his face, too, was very thin, with a dark complexion. His profile was very prominent. His looks and expression were earnest and powerful; his black, unpowdered hair hung down evenly over both shoulders in wide, lengthy tresses-oreilles de chien [dog's ears], as one says-and was gathered into a rather flattened pigtail reaching to the middle of his narrow back. He wore a blue overcoat, with-if I remember rightly-an embroidered collar." During the same trip, General von Graffenried von Gerzensee described Napoleon: "Bonaparte wore a simple coatee, close-fitting trousers, and boots reaching to the calf, trimmed with gold braid. His long hair was gathered in a pigtail. He was very thin and haggard; coughed often, as if he were consumptive, and was hollow-chested. He had a soft, weak voice....His speech was short and precise and uncommonly interesting. His eyes were mild and speaking, his tones pleasing, and his mouth full of expression." Chateaubriand described him, during the Consulate: "His face made a favourable impression on me, for up to now I had seen him only in the distance. His smile is friendly and winning, his eyes wonderful, especially in the way they are set deep under his forehead and overshadowed by his eyebrows. There is nothing of the charlatan in his appearance, nothing theatrical or artificial....An extraordinary imagination animated this cold politician; lacking the inspiration of this Muse, he could never have attained such heights." A description by Hyde de Neuville, Royalist conspirator, in his memoirs: "The door opened. Instinctively I looked at the man who came in, short, thin, his hair plastered on his temples, his step hesitating; he was not in the least what I had pictured to myself. I was so wanting in perception that I took him for a servant, a mistake which was confirmed when he walked across the room without taking any notice of me. He leaned his back against the chimney-piece, raised his head and looked at me with such an impressive, such a penetrating glance that I lost all my assurance under the fire of that questioning eye. To me he had suddenly grown taller by a hundred cubits." Joseph Farington (The Farington Diary, New York: G.H. Doran, 1923-8) in 1802 observed Napoleon close up: "He was dressed in Blue with White waistcoat and Breeches. His Hat quite plain with a very small Cockade....The ease with which people of all sorts approached him sufficiently shew'd that He had no personal apprehension....I noticed that He picked is nose very much,--sometimes took Snuff, and would take off His Hat and wipe his forehead in a careless manner.-I also remarked that some of his Officers occasionally spoke to him, without His having addressed them, and seemed only to be making such remarks as persons who are on an easy footing do to each other....Here He stood abt. 3 yards from me abt. 10 minutes reading a paper....I noticed that all his actions were unstudied and quite & natural & calm....He looked me full in the face which gave me an opportunity to observe the colour of his eyes which are lighter, and more of a blue grey, than I should have expected from his complexion ["His complexion is not as I have heard it described waxy, but though wanting in colour sufficiently healthy. "]....I thought there was something rather feverish than piercing in the expression of his eyes, but his general aspect was milder than I had before thought it....His person is below middle size. I do not think him more than 5 feet 6, I rather judge him to be less than that measure. Mr. [Benjamin] West [the famous painter] thinks otherwise. ["West thinks him 5 feet 7 inches high."] He is not what can be called thin. He is sufficiently full in the Shoulders and body & thighs for his age & height....[Samuel] Rogers [the poet] stood a little way from me and...seemed to be disappointed in the look of his Countenance and said it was that of a little Italian....[Farington observed that Napoleon] had no eye-brows, or eye-lash to give strong expression." A description of Napoleon by Doctor Corvisart in 1802: "Napoleon was of short stature, about five feet two inches by French measure [5 feet 6 inches, English measure], and well built, though the bust was rather long. His head was big and the skull largely developed. His neck was short and his shoulders broad. His legs were well shaped, his feet were small and well formed. His hand, and he was rather proud of it, was delicate, and plump, with tapering fingers. His forehead was high and broad, his eyes gray, penetrating and wonderfully mobile; his nose was straight and well shaped. His teeth were fairly good, and mouth perfectly modelled, the upper lip slightly drawn down towards the corner of the mouth, and the chin slightly prominent. His skin was smooth and his complexion pale, but of a pallor which denoted a good circulation of blood. His very fine chestnut hair, which, until the time of the expedition to Egypt, he had worn long, cut square and covering his ears, was clipped short. The air was thin on the upper part of the head, and left bare his forehead. "The shape of his face and the ensemble of his features were remarkably regular. When excited by any violent passion his face took on a stern and even terrible expression. A sort of rotary movement very visibly produced itself on his forehead and between his eyebrows; his eyes flashed fire; his nostrils dilated, swollen with the inner storm. He seemed to be able to control at will these explosions, which, by the way, as time went on, became less and less frequent. His head remained cool. In ordinary life his expression was calm, meditative, and gently grave. When in a good humor, or when anxious to please, his expression was sweet and caressing, and his face was lighted up by a most beautiful smile. Amongst familiars his laugh was loud and mocking." A description by Madame de Rémusat: "Bonaparte dictated with great ease. He never wrote anything with his own hand. His handwriting was bad and as illegible to himself as to others; and his spelling was very defective. He utterly lacked patience to do anything whatever with his own hands. The extreme activity of his mind and the habitual prompt obedience rendered to him prevented him from practicing any occupation in which the mind must necessarily wait for the action of the body. Those who wrote from his dictation---first Monsieur Bourrienne, then Monsieur Maret, and Méneval, his private secretary---had made a shorthand for themselves in order that their pens might travel as fast as his thoughts. "He dictated while walking to and fro in his cabinet. When he grew angry he would use violent imprecations, which were suppressed in writing and which had, at least, the advantage of giving the writer time to catch up with him. He never repeated anything that he had once said, even if it had not been heard; and this was very hard on the poor secretary, for Bonaparte remembered accurately what he had said and detected every omission. . . . He always derived amusement from causing any one uneasiness and distress. His great general principle, which he applied to everything, both great and small, was that there could be no zeal where there was no disquietude. . . .
"Bonaparte's reception by the troops was nothing short of rapturous. It was well worth seeing how he talked to the soldiers, ---how he questioned them one after the other respecting their campaigns or their wounds, taking particular interest in the men who had accompanied him to Egypt. I have heard Madame Bonaparte say that her husband was in the constant habit of poring over the list of what are called the cadres of the army at night before he slept. He would go to sleep repeating the names of the corps, and even those of some of the individuals who composed them; he kept these names in a corner of his memory, and this habit came to his aid when he wanted to recognize a soldier and to give him the pleasure of a cheering word from his general. He spoke to the subalterns in a tone of good-fellowship, which delighted them all, as he reminded them of their common feats of arms." 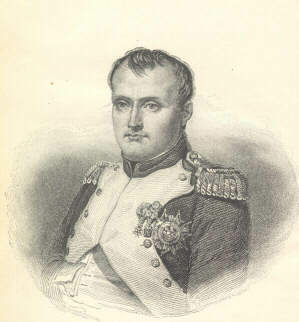 A description of Napoleon, by Molé, presiding at the Council of State: "Sitting deep in the armchair from which he presided...the little gold snuffbox which he was constantly and automatically opening to take pinches of tobacco which he breathed in noiselessly and most of which fell back on the white lapels of his uniform which were soon covered with it, finally the mechanical movement of his arm to hand the snuffbox to the chamberlain standing behind him who filled it and gave it back to him. All that defined him so strongly as a man meditating in solitude that all eyes were on him but the silence was unbroken..."
Dennis Davidov's description (from his Memoirs) of Napoleon at Tilsit in 1807: "I have already remarked on how much I was struck by the overall resemblance of Napoleon to the prints on sale everywhere. But the same was not true of his facial features. None of the portraits that I had seen bore the least resemblance to him. Believing them, I had supposed that Napoleon sported a rather large hooked nose, dark eyes and dark hair- in a word, the true Italian facial type. In fact, his face was slightly swarthy, with regular features. His nose was not very large, but straight, with a very slight, hardly noticeable bend. The hair on his head was not black, but dark reddish-blond; his eyebrows and eyelashes were much darker than the colour of his hair, and his blue eyes, set off by the almost black lashes, gave him a most pleasing expression. Finally, no matter how many times I had occasion to see him, I never noticed those frowning eyebrows with which the portrait-pamphleteers endowed him. "The man I saw was of short stature, just over five feet tall, rather heavy although he was only 37 years old and despite the fact that the lifestyle he followed should not, on the face of it, have let him put on much weight. He held himself erect without the least effort, as is common with all short people. But what was peculiar to him alone was a nobility of bearing and an urbane, martial air, which undoubtedly was derived from the habit of commanding men and a consciousness of moral superiority. No less remarkable were the ease and frankness of his approach, his natural dexterity and the quickness of his movements." 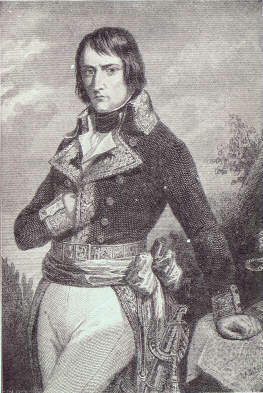 The German author Wieland described him in 1808: "I had been [at the ball for] hardly a few minutes when Napoleon came over to me from the other side of the ballroom; the Duchess herself presented me to him, and he made the usual remarks to me, very affably, but gazing intently into my face. Probably there is scarcely a human being who has the gift of fathoming a man almost at first glance, and 'seeing through him', as one says, in a higher degree than Napoleon. He saw that I, for all my pitiful celebrity, was only a simple and unassuming old man, and since he apparently wished to leave me with a good impression of him for ever, he changed himself for the moment into the form in which he could be sure of doing so. Never in my life have I seen a man more simple, quiet, mild and unpretentious. There was not a sign that my companion was conscious of being a great monarch. He conversed with me like one old acquaintance with another, and what is more-a thing none of my equals have yet experienced-continued for an hour and a half without break and quite alone..."
In 1809 the painter Adam wrote: "There he sat on his little white Arab horse, in a rather careless posture, with a small hat on his head, and wearing the famous dust-grey cloak, white breeches and top boots, so insignificant-looking that no one would have recognized the personage as the mighty Emperor-the victor of Austerlitz and Jena before whom even monarchs must bow-if they had not seen him represented so often in pictures. His pale face, cold features, and keen, serious gaze made an almost uncanny impression on my mind, while the glitter of the many uniforms which surrounded him heightened the contrast of his inconspicuous appearance." The Russian Baron von Lowenstern first met Napoleon in Vienna in 1809: "Finally, I was able to see this man! I really must say that as I approached him, in no way did he make the impression on me that I had anticipated. I found him more corpulent that he is usually portrayed. His gait was hardly gracious, his manner lacking honour". A German teacher in Dusseldorf in 1811: "The Emperor's face was turned to us in profile, when he bent forward to listen to the President's welcoming speech. Its pure, classical outline reminded one strongly of the busts of the [Roman] Emperor Augustus. It was certainly very imposing....There was also something friendly about it at the moment he was listening to the speech, and he must, I think, have been in a kinder and more gentle frame of mind that day. The impression which he left on me was not at all the repulsive one which I had really expected, and I was glad of it; for though a world-shattering greatness might appear in an outwardly disgusting form, it would be incredible that thousands should be taken in by it, and a whole nation actually carried off its feet with enthusiasm." Novelist Paul de Kock , who saw him in 1811, called Napoleon: "yellow, obese, bloated, with his head too far down on his shoulders." Two descriptions by British observers in 1815. First Capt. Ross, commander of the Northumberland: "He is fat, rather what we call pot-bellied, and although his leg is well shaped, it is rather clumsy, and his walk appears rather affected, something between a waddle and a swagger-but probably not being used to the motion of a ship might have given him that appearance. He is very sallow, with light grey eyes, and rather thin, greasy-looking brown hair, and altogether a very nasty, priestlike-looking fellow....He never gave the smallest trouble to anyone, and every day was the same; he was very communicative, and seemed fond of being asked questions; his manners are by no means good, and his voice very harsh and unpleasing." Sir George Bingham, also aboard the Northumberland: " He was dressed in a plain green uniform, with plain epaulets, white kerseymore waistcoat and breeches, with stockings, and small gold shoe-buckles, his hair out of powder and rather greasy, his person corpulent, his neck short, and his tout ensemble not at all giving an idea that he had been so great or was so extraordinary a man." Kircheisen, F.M. Napoleon New York : Harcourt, Brace, 1932. Napoleon - An Intimate Account of the Years of Supremacy 1800-1814. Edited by Proctor Patterson Jones, published by Random House, Inc., 1992. Seward, Desmond. Napoleon's Family New York : Viking, 1986.